The dynamics of a football match are often dictated by the scoreline and teams will often try to influence this via their approach; a fast start in search of an early goal, keeping it tight with an eye on counter-attacking or digging a moat around the penalty area. With this in mind, I’m going to examine the repeatability of the amount of time a team spends winning, losing and drawing from year to year. I’m basically copying the approach of James Grayson here who has looked at the repeatability of several statistical metrics. This is meant to be a broad first look; there are lots of potential avenues for further study here. I’ve collected data from football-lineups.com (tip of the hat to Andrew Beasley for alerting me to the data via his blog) for the past 15 English Premier League seasons and then compared each teams performance from one season (year zero) to the next (year one). Promoted or relegated teams are excluded as they don’t spend two consecutive seasons in the top flight. Below is a plot showing how the time spent losing varies in consecutive seasons. Broadly speaking, there is a reasonable correlation from one season to the next but with a degree of variation also (R^2=0.41). The data suggests that 64% of time spent winning is repeatable, leaving 36% in terms of variation from one season to the next. This variation could result due to many factors such as pure randomness/luck, systemic or tactical influences, injury, managerial and/or player changes etc. 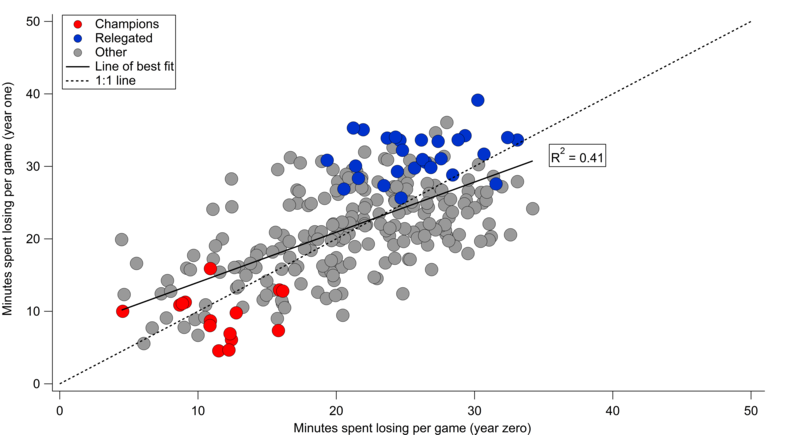 Relationship between time spent losing per game from one season to the next. As might be expected, title winning teams and relegated sides tend towards the extreme ends in terms of time spent losing. Generally, teams at these extreme ends in terms of success over and under perform respectively compared to the previous season. Below is the equivalent plot for time spent winning. Again there is a reasonable correlation from one season to the next, with the relationship for time spent winning (R^2=0.47) being stronger than for time spent losing. The data suggests that 67% of time spent winning is repeatable, leaving 33% in terms of variation from one season to the next. Relationship between time spent winning per game from one season to the next. As might be expected, title winning teams spend a lot of time winning. The opposite is true for relegated teams. Title winners generally improve their time spent winning compared to the previous season. Interestingly, they often then see a drop off in the following season. Manchester City and Liverpool really stick out here in terms of their improvement relative to 2012/13. Liverpool spent 19 minutes more per game in a winning position in 2013/14 than they did the previous season; I have this as the second biggest improvement in the past 15 seasons. They were narrowly pipped into second place (sounds familiar) by Manchester City this season, who improved by close to 22 minutes. They spent 51 and 48 minutes in a winning position per game respectively. They occupy the top two slots for time spent winning in the past 15 seasons. According to football-lineups.com, Manchester City and Liverpool scored their first goals of the match in the 26th and 27th minutes respectively. Chelsea were the next closest in the 38th minute. They were also in the top four for how late they conceded their first goal on average, with Liverpool conceding in the 55th minute and City in the 57th. Add in their ability to rack up the goals when leading and you have a recipe for spending a lot of time winning. The final plot below is for time spent drawing. Football-lineups doesn’t report the figures for drawing directly so I just estimated it by subtracting the winning and losing figures from 90. There will be some error here as this doesn’t account for injury time but I doubt it would hugely alter the general picture. The relationship here from season to season is almost non-existent (R^2=0.013), which implies that time spent drawing regresses to the mean by 89% from season to season. 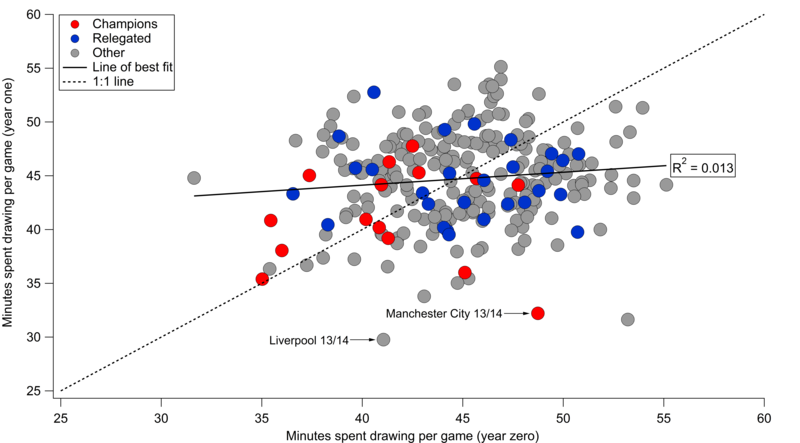 Relationship between time spent drawing per game from one season to the next. Teams seemingly have limited control on the amount of time they spend drawing. I suspect this is a combination of team quality and incentives. Good teams have a reasonable control on the amount of time they spend winning and losing (as seen above) and it is in their interests to push for a win. Bad teams will face a (literally) losing battle against better teams in general, leading to them spending a lot of time losing (and not winning). It should be noted that teams do spend a large proportion of their time drawing though (obviously this is the default setting for a football match given the scoreline starts at 0-0), so it is an important period. We can also see the shift in Liverpool and Manchester City’s numbers; they replaced fairly average numbers for time spent drawing in 2012/13 with much lower numbers in 2013/14. Liverpool’s time spent drawing figure of 29.8 minutes this season was the lowest value in the past 15 seasons according to this data! There we have it then. In broad terms, time spent winning and losing exhibit a reasonable degree of repeatability but with significant variation superimposed. In particular, it seems that title winners require a boost in their time spent winning and a drop in their time spent losing to claim their prize. Perhaps unsurprisingly, things have to go right for you to win the title. 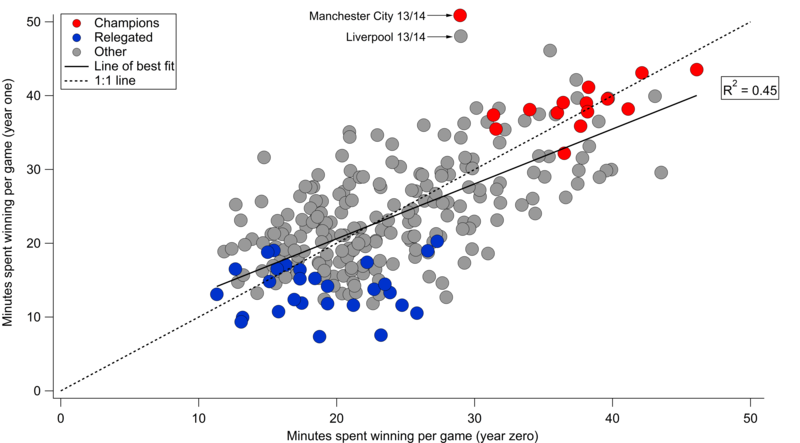 As far as this season goes, Manchester City and Liverpool both improved their time spent winning dramatically. If history is anything to go by, both will likely regress next season and not have the scoreboard so heavily stacked in their favour. It will be interesting to see how they adapt to such potential challenges next year. This entry was posted in English Premier League, Liverpool, Manchester City, Repeatability and tagged EPL, Liverpool, Manchester City by Will Gurpinar-Morgan. Bookmark the permalink.